February is National Bird Feeding Month because it is one of the most difficult months in much of the U.S. for birds to survive in the wild. And February 15-18, 2019 is The Great Backyard Birdcount (#GBBC). That is a citizen science project where everyone can take 15 minutes to count what birds they see in their yard and submit their observations to gbbc.birdcount.org. 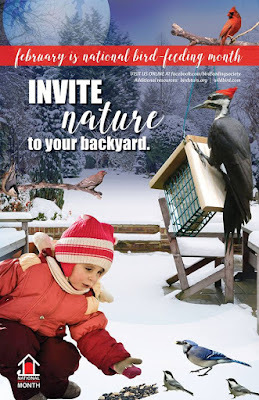 Invite nature to your backyard by filling bird feeders with fresh, high fat, high protein foods. Wild Birds Unlimited has a wide variety of seed, suet, seed cylinders, mealworms, and more. Using a heated birdbath and adding bird houses helps create an oasis for birds which in turn brings a welcome flash of color, dash of motion and splash of sound into the backyard, particularly during long Michigan winters.